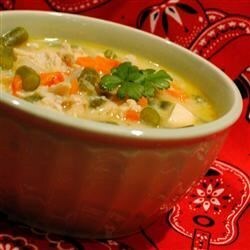 "Delicious blend of fresh veggies, cheese and chicken. EASY!" Very flavorful. Even worked with "veggie shreds" instead of cheese for those who may be lactose intolerant and are missing the creamy soup recipes. Impressively good soup. I followed the directions exactly except I thickened with 1 tbs. cornstarch instead of the roux. I will make this again for sure. Delicious soup with great flavor. I would definately call it a "soup" rather than a "chowder" because it is a thin soup. I added some cornstarch to thicken it. This soup had a very good flavor, but was a little on the thin side. I will thicken it more if I make it again.